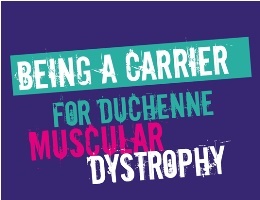 Action Duchenne, in collaboration with Sue Kenwrick, Principal Genetic Councellor, Addenbrooke's Hospital, Cambridge, have produced a ground-breaking leaflet 'Being a Carrier for Duchenne Muscular Dystrophy'. This leaflet is distributed to all Neuromuscular Centres, Genetic Services and groups working with families affected by Duchenne muscular dystrophy. The inspiration for this leaflet came from workshops for Duchenne carriers and other female relatives held by Action Duchenne, as well as sibling events and discussions arising from the "What about Us" element of the Lottery funded Takin' Charge. Takin' Charge looks at issues in Transition for young people and their families, affected by Duchenne. The format of the leaflet follows frequently asked questions that come up when carriers or relatives are given an opportunity to discuss the issues involved. The project has been led by the Duchenne community, thank you to all contributors who have made this valuable resource possible. This online guide takes you through the different topics or domains of the diagnosis and management of Duchenne muscular dystrophy.